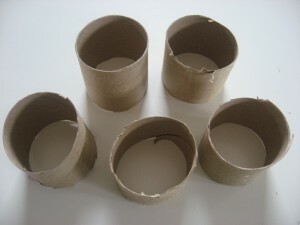 I love using toilet paper rolls for crafts, it’s one thing that the vast majority of households have on hand at any given time. 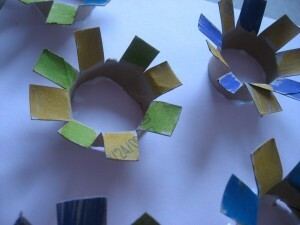 I love the 3D aspect of this craft and the fine motor work it demands for coloring the petals. 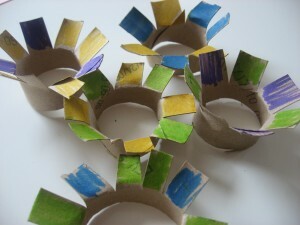 It can also be used to teach patterns- or simply art done any way they choose! Toddlers can get in on the action by dipping the cut rolls into plates of paint instead of coloring the petals one by one! You may notice my son is absent, he was outside enjoying the sun and making houses for worms. Gather your materials. You will need 2-3 toilet paper rolls, a piece of heavier paper ( construction paper or card stock), some markers or paint, scissors and glue. Start by cutting your rolls into smaller pieces. 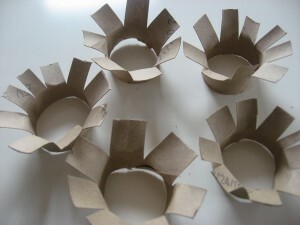 Cut vertically into the roll and fan it out to make petals. Color the petals with markers, or paint. This takes patience , which makes this a great group project hand a group of kids a small number of flowers and have them each make the number they wish , so it’s not overwhelming. 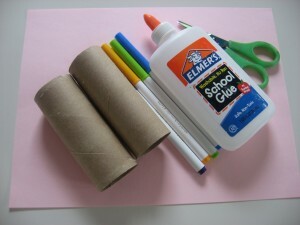 Add glue and place the flowers on your paper- ours is pink and looks great in person but is washed out in the pictures. Pop on the paper and let dry. We let it dry for 4-5 hours before moving it. 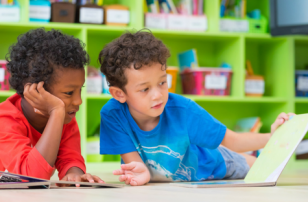 The Tiny Seed by Eric Carle is a story about a tiny seed who unlike the other seeds from his flower makes it against all odds to continue the cycle of life. 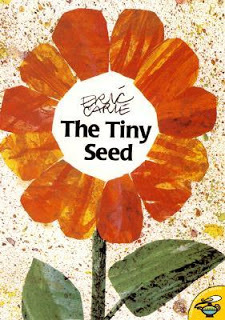 I really enjoy this book and love how it shows all the obstacles along the way for a simple little seed. My son liked this book but didn”™t make it all the way through, which I expected since it is a long book for a 2 year old. 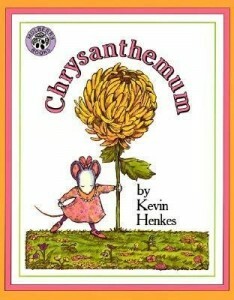 Chrysanthemum by Kevin Henkes is a lovely book about having confidence, loosing confidence and regaining it in the end. Chrysanthemum is a little mouse who loves her name until she goes to school and is picked on for it being out of the ordinary. Who can”™t relate to this? I know I can . Thankfully my son has yet to experience this all too common, but still so heartbreaking experience . I love that I have a book like this to share with him and open up about it before it happens. Ultimately Chrysanthemum learns to love her name again and regains the confidence she once had. Another fantastic book from a consistently wonderful author. 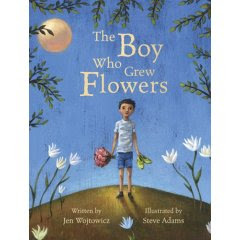 The Boy Who Grew Flowers by Jennifer Wojtowicz is one of those books that stays with you. Rink is a little boy who”™s family is strange, Rink is no exception, with every full moon he sprouts flowers , from his head. At school he is an outsider and only when a new girl comes to school does he make a friend. He reaches out to her because she too is an outsider, not at school, in her own family. In the end the kindred spirits celebrate their uniqueness. This odd romantic story will warm your heart and serves as a great lesson about how we all feel different and like an outsider sometimes. The illustrations by Steve Adams will stun you, they were so vibrant and paired so perfectly with the story. Wonderful! Adorable as usual! So creative! 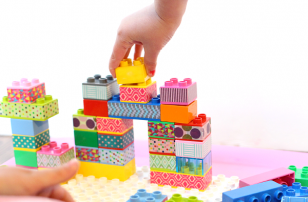 After the baby is down for a nap, we’ll be doing this! THINK SPRING! I am always grateful for ideas that use paper towel and toilet paper holders. 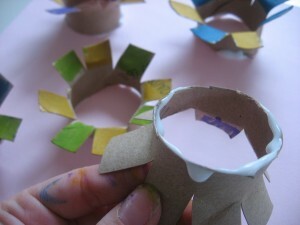 On the Frugal Family Fun blog they made similar flowers–but much bigger–with an oatmeal container. Very Creative! We are definitely going to do this one! .-= Tonya´s last blog ..Guji Guji =-. We’re going to do this today. Thanks (again!) 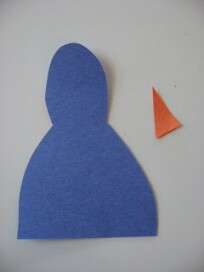 for the craft idea. .-= Melodie´s last blog ..Nachos and Guacamole =-. .-= Amber´s last blog ..My Shampoo-Free Experiment =-. .-= Amanda´s last blog ..Canvas Painting with friends! =-. Totally jealous that you have un-frozen ground 😉 . After this last foot of snow melts my boys will love finding worms. In the meantime, thankyou for continuing the crafts. My 20m/o and 3.5y/o both loved the tree bud project last week 🙂 . 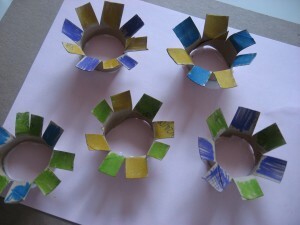 Trisha- I saw those flowers on Frugal Family Fun Blog last week after I made these. 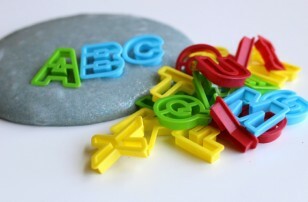 I thought they were so clever as well- I linked them ( the post may not have gone up yet, I pre posted/ and scheduled a whole weeks worth of posts for both blogs since i am away this week) on my familyeducation.com blog. I love using “trash” to create! My daughter has so many “unconventional” toys. 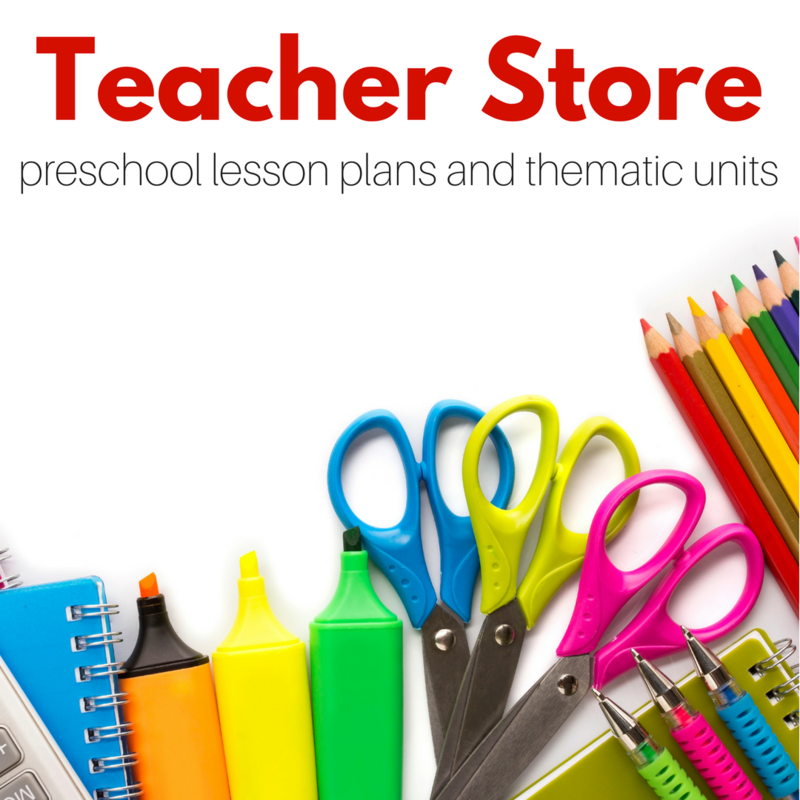 I heard about your new ebook from Impress Your Kids! I’ll have to get that when my girl is a little older. .-= Adventure Mom Janna´s last blog ..Praying for Children to Have Godly Friends and Role Models =-. Aren’t you nice to respond to my comment! I think it would be fun to have a whole mess of flowers of different sizes. I haven’t been able to think of any items to make an in between size. I wonder if applesauce or yogurt containers would work? Have a great trip next week! Yogurt would be cool with older kids but possibly pretty sharp with younger ones. .-= The Katies´s last blog ..Show and Tell #3 =-. This would be great to make as fireworks for the 4th of July! 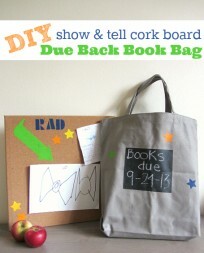 I am SO going to make them ( with full credit for your brilliance! ) ! I like what you did with toilet paper rolls.